The Outstanding Community Engagement Award was created in 2009 by Provost Shirley Willihnganz as a way to recognize faculty, staff, students and community partners who are involved in outstanding community engagement service. **Due to budget constraints, the monetary portion of the award has been suspended. 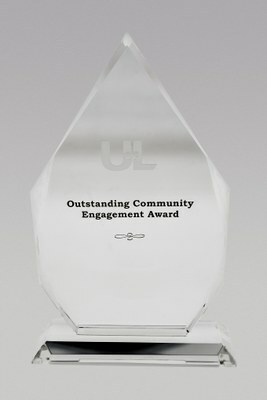 Honorees engaged in exemplary community engagement activities such as volunteerism, community based learning, outreach, partnerships, curricular engagement or community based research will receive a crystal award, and their name will be added to the permanent recognition display located in Ekstrom Library. Recipients will be selected based on their work to improve community, particularly in the areas of, but not necessarily, Education, Health, Economic Development, Social Services, Arts and Culture, or Sustainability. The award is intended to recognize outstanding local, regional, rural, or international engagement. All nominees will be invited to attend the Community Engagement Ceremony & Reception in Fall 2017 where award recipients will be announced. Previous award recipients are not eligible to apply for this award cycle, however previous nominations are strongly encouraged to resubmit. Staff in the Office of Community Engagement are not eligible to receive the award. Community Partners must be nominated by a university student, faculty, staff or alumnus. In the event there is no community partner nominated, the Office of Community Engagement in consultation with the award review committee, reserves the right to identify a deserving community partner to recognize. There is no requirement for the award to be given in every category each year. PLEASE NOTE: Effective for the 2015-16 award cycle, the nomination forms are now electronic. Please submit your nomination on the form provided. For questions regarding criteria or the nomination process, please email Susan Jenkins.